To reduce battery consumption and save, there are some of tips. 1. Set mobile networks option to Auto or Off. Enabling mobile networks always on will significantly increase battery consumption. 2. When you have the mobile device nearby, please disable the “Forward calls to Gear” feature. You can set the mobile device to forward incoming calls to the Gear and use this feature when the Gear is connected to the mobile device via the remote connection feature. But, please enable this call forwarding feature when mobile device is placed on far distance since this increase battery consumption. 3. You can set the Gear to receive notifications from the mobile device with a variety of events, such as missed calls or new messages. But, please select the minimum necessary alerts to notify. 4. 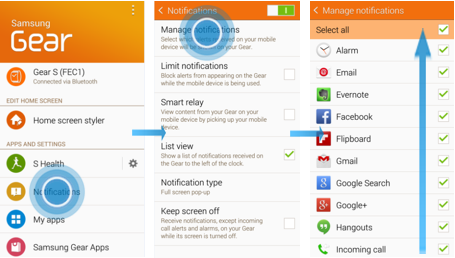 Receive notifications, except incoming call alerts and alarms, on your Gear while its screen is turned off. 5. What you don’t use “Wake-up gesture” feature on Gear S will help to save the battery. 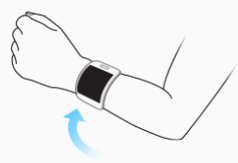 To wake up the Gear, you can raise the arm that your Gear is on and look at the Gear’s screen via Wake-up gesture. 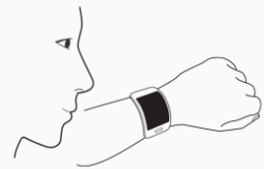 But, this feature may consume more of the Gear’s battery power because its motion sensor is always on. 6. On S Voice, turn off the Voice wake-up feature. 7. What you don’t use “Clock always on” feature on Gear S will help to save the battery because it set the Gear to display a clock when the screen is turned off. 8. Activate power saving mode to save the battery power by limiting the Gear’s functions. Tap Settings → Power saving → Power saving mode → Enable Power saving mode. • Displays colors on the screen as grey tones. • Deactivates the clock always on feature. • Deactivates the mobile data connection when the screen turns off. • Deactivates the Wi-Fi and motion features.